More venues and dates added for Much Ado screenings, including regional Victoria THIS is how you invite Nathan Fillion to visit your country! Browncoats of Poland FTW!! To celebrate the Australian release of Joss Whedon’s Much Ado About Nothing on July 11, we’ve got Double Passes to give away thanks to Sharmill Films! 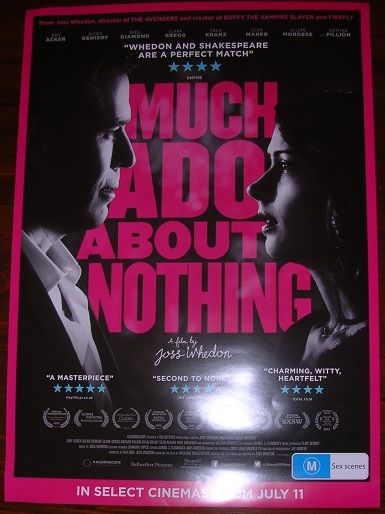 Two lucky winners will also receive a Much Ado About Nothing poster! For your chance to win, simply enter via Facebook or Twitter. And you can enter via both to double your chances! – Like our page on Facebook, then reply to this post and tell us who your favourite Joss Whedon character is and why. Two random winners will be chosen (one from Facebook and one from Twitter) to receive a Much Ado About Nothing poster and a double pass to the film. Passes are valid for Thursday 18 July – Wednesday 31 July inclusive (see Double Pass Terms and Conditions below for eligible cinemas and sessions, and other restrictions). – If we reach 1000 Followers on Twitter by the entries deadline we’ll add another double pass into the prize pool (2 winners)! And if we reach 1100 Followers, we’ll add one more (3 winners)! – If we reach 700 Likes on Facebook by the entries deadline we’ll add another double pass into the prize pool (2 winners)! And if we reach 800 Likes, we’ll add one more (3 winners)! Entries close on Sunday 14 July at 11:59PM. Winners will be contacted on Monday 15 July, and passes will be mailed on Tuesday 16 July. Note: The posters were used by Sharmill Films for promoting the film at Oz Comic Con and while they are in great condition they aren’t perfect and have velcro dots on the backs. They’re still gorgeous though!